Spotted by Revu, listings on sites such as Abenson reveal a phone with a 6.15-inch 1080 x 2312 screen complete with a teardrop notch at the top and a small bezel at the bottom. The Huawei P30 Lite is also listed as having a triple-lens rear camera with a 24MP main lens, an 8MP wide-angle one and a 2MP depth sensor, while around the front there’s a 32MP camera. There’s also supposedly an octa-core Kirin 710 chipset (which notably is lower end than the Kirin 980 found in the main P30 range), 6GB of RAM, 128GB of storage, a 3,340mAh battery with fast charging, and a fingerprint scanner on the back. As you can see in the images above the back is seemingly glass and among the shades offered there’s a gradient color scheme. There’s also a 3.5mm headphone port. The P30 Lite supposedly starts shipping on the April 10 or April 4 depending on where you order from, and it costs 16,990 Philippine pesos (around $320/£245/AU$455). Pre-orders come with a selection of freebies depending on the store, including a Bluetooth speaker, a selfie stick, and a power bank. Of course, pricing and pre-order bonuses are sure to differ in other countries. While this all looks convincing, we’d still take this information with a pinch of salt until we hear officially about the P30 Lite from Huawei, and as yet we don’t know for sure what countries it will actually be sold in either. 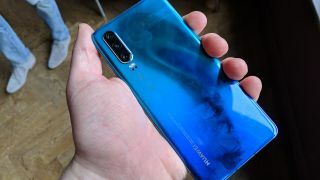 But if the Huawei P30 looks too pricey for you then it’s likely that there will soon be a cheaper alternative.